The Bronze Medal match can sometimes feel like a let-down after a losing semi-final but you can guarantee that both of these teams will be well up for this game. There is a lot riding on the match and every player on the court will be desperate to head home from Rio with a medal. You may not set out to win a Bronze Medal but when the choice is between Bronze and nothing, everyone wants to take the Bronze. Patty Mills for Australia is currently the second ranked player with respect to points. In 5 games, he has notched an average of 21.1 points per game. He is behind Bojan Bogdanović from Croatia, who of course has returned home. It is unlikely that Mills will be able to overturn this deficit to take this individual title, but he should be able to close the gap. Pau Gasol is currently the top ranked player for rebounds in the tournament, with an average of 8.7 after 6 games in the tournament. A poor return for rebounds in this game may seem Gasol slip down the table but a strong individual performance can also boost his team, so expect Gasol to see out his tournament on a high. Spain are deemed to be the favourites for this game and they should have enough to take care of business. You can back Spain at -6, which is provided at odds of 1.90 for this game. Anyone that is looking to enjoy the Over/Under market should look to go OVER 165.5 which is provided at odds of 1.90 for this game. Bet Now! The Race to 20 Points is a close affair. 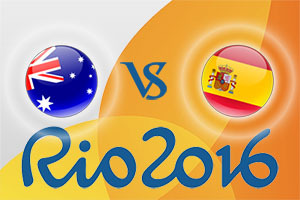 Spain can be backed at odds of 1.55 while Australia are listed at odds of 2.40. The Double Result is also something that is worth considering. You can take Australia at half-time, Spain at full-time at odds of 6.00 while a Spain-Spain outcome comes in at odds of 1.80. The game starts at 1530 BST on Sunday 21st of August.